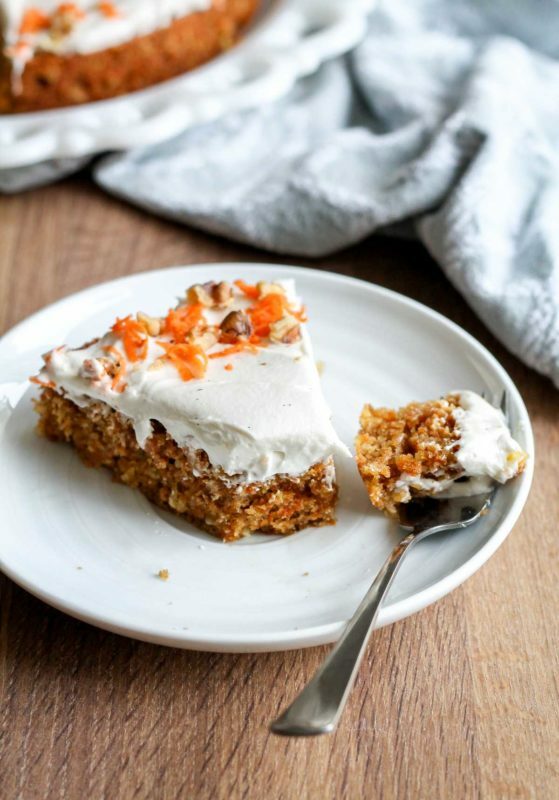 I can’t lie: carrot cake is actually my favorite cake on earth. 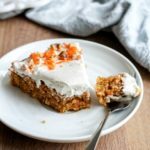 I’m not going to turn my nose up at chocolate cake or banana cake or even a really good vanilla cake with raspberry filling and chocolate frosting (that does sound good right now), but if you asked me to pick favorites, carrot cake would win every. single. time. 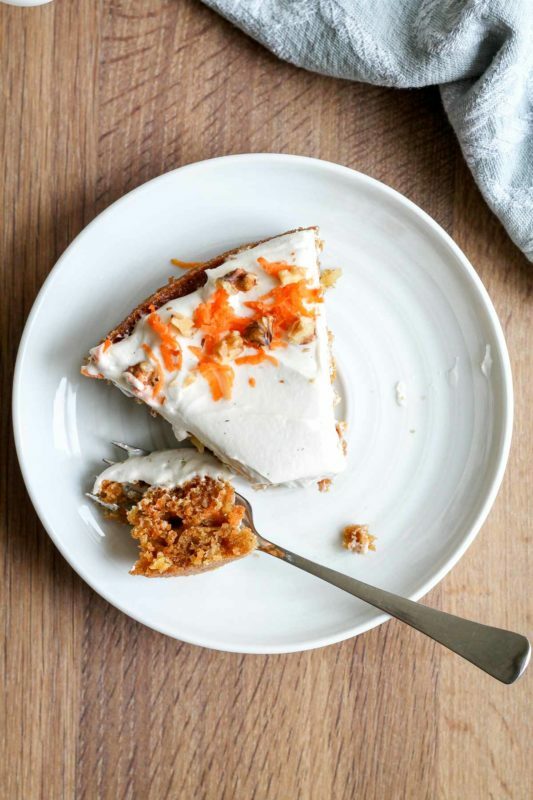 Which is why it’s high time that we had a recipe for a true carrot cake on this little blog. Oddly, I’ve created recipes that mimicked carrot cake on here: carrot cake cinnamon rolls, carrot cake scones. 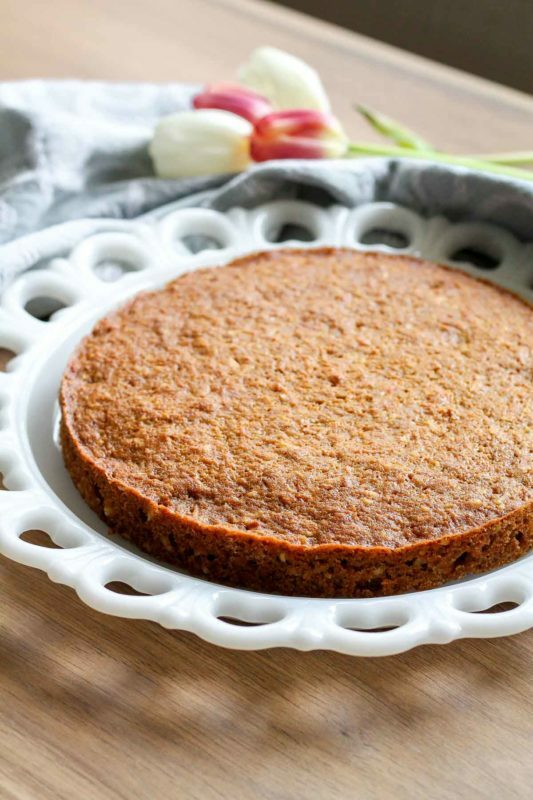 But up until now, we didn’t have the real deal, assertively-spiced, chock-full-of-carrots, honest-to-goodness carrot cake, and I’m fixing that today. As a single layer carrot cake, of course. I think I’m going to start a series on single layer cakes (I guess I have already, since this is the third one I’ve posted in the past couple months). The thing is, I like cake, but when there’s only two of us around, making a double or triple layer cake just isn’t a good idea. Not only does it use an outrageous amount of butter and sugar, but layer cakes are a finicky hassle to deal with – all that stacking and spreading and crumb coats and turntables and frosting ratios….ugh. Then, after all that, we have a giant cake sitting around the house and only two of us to eat it, which isn’t necessary or advisable for anyone involved. Thus, my penchant for single layer cakes. I’m slightly surprised to find that when googling this for research, there aren’t all that many recipes specifically for single layer cakes out there. 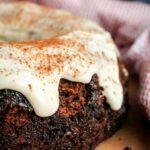 There are some, like coffee cakes or yogurt cakes or classic Italian cakes, that are designed to be a single layer and made in a springform pan, but there really aren’t all that many classic frosted cakes that have been turned into single layer versions (at least not that I found). I’m more than happy to step up to the plate. It’s really not all that hard to turn your favorite layer cakes into single layer cakes, but you have to be good at proportions. I really don’t mind doing all the math for you when I get results like these. I actually made this cake for Brian’s 30th birthday last weekend, and we ate it for breakfast in bed (with bacon on the side, YOLO) with no regrets. 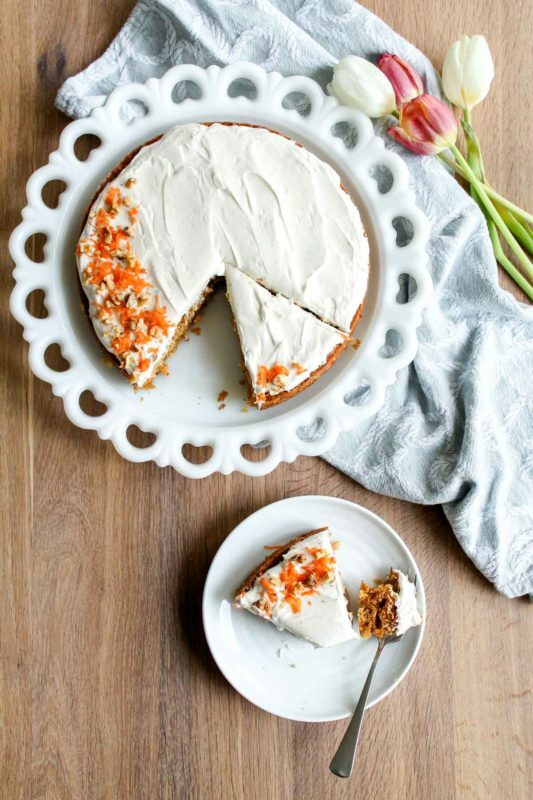 Carrot cake was also our wedding cake, so, you know, we like it a little. It is chock full of carrots. This isn’t some namby-pamby spice cake masquerading as a carrot cake, as most box mixes and commercially made carrot cakes will be. No. We’re getting maximum bang for our carrot buck – 2 full cups of grated carrots in this baby. Yes, you have to grate the carrots. Sorry. Use a box grater, it really doesn’t take that long (only 2-3 carrots needed) and it’s worth it. Using a food processor to grate them is possible, but make sure you get it down to really really small pieces so they can soften enough while baking. There’s coconut in there too. You don’t have to add it if you don’t like it. If you do like it, you’re going to love this. No mixer required for the cake. This is a bowl and whisk operation, just the way I like it. Ideally, you whisk the dry and wet ingredients separately and then add one to the other, but you can do the whole thing in one bowl and I won’t tell (I’ve done it). Cream. Cheese. Frosting. Need I say more? Should you add grated carrots and chopped walnuts or pecans on top as decoration? I say life is too short not to. 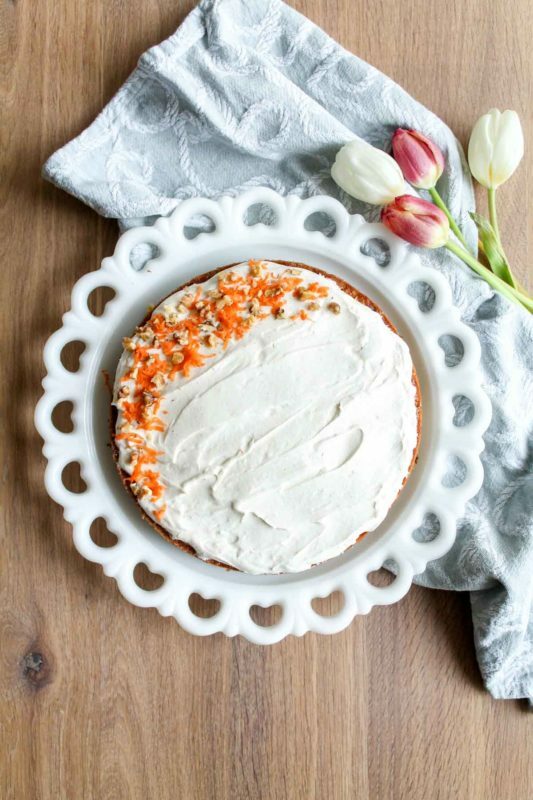 Sweet, spiced, and positively loaded with carrots: this single layer carrot cake with cream cheese frosting delivers on a spring classic in smaller proportions. Preheat your oven to 350 degrees F. Grease a 9-inch round cake pan. I also like to line the bottom of the pan with parchment paper, to give extra insurance that the cake will come out cleanly. Just trace the bottom of the pan on a sheet of parchment paper and cut it out, then place inside the pan. In a medium bowl, whisk the dry ingredients: flour, baking powder, baking soda, cinnamon, nutmeg, and salt. Set aside. In a large microwave-safe bowl (I use a large glass bowl), or on the stove, melt the butter. Let it sit for a couple minutes to cool, then whisk in the brown sugar, followed by the eggs one at a time, until combined and smooth. Dump the dry ingredients into the bowl with the wet ingredients and stir together until well-combined and no lumps remain. Fold in the carrots and shredded coconut until evenly distributed. 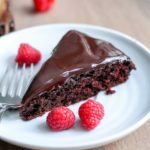 Pour the batter into the prepared pan, smooth out the surface, and bake for 35 minutes, or until cake springs back when touched and a tester inserted in the center comes out clean. Let cake cool in pan on a rack for 10 minutes, then invert the pan onto the rack to release the cake, remove the parchment from the bottom, and flip back right side up onto a cake plate. Let cake cool while you prepare the frosting. In a large bowl using a stand mixer with the whisk attachment, or a hand mixer, beat cream cheese and butter at high speed until pale and very fluffy - this should take 2-3 minutes. You want to incorporate as much air as possible into the mixture to make it light and fluffy. Add the powdered sugar, vanilla, and salt, and beat at medium to high speed until fully combined and light. Spread cooled cake with cream cheese frosting. It should make a thick layer, and can be swirled in pretty patterns with an offset spatula (I like this one). Decorate the outer edges of cake with additional grated carrots and chopped walnuts or pecans if desired. Serve! Cake will keep, well-wrapped in the fridge, for up to 4 days. I like to microwave leftover pieces of cake on 50% power for 20 seconds to reheat. *I grated the carrots by hand using a box grater, which sounds like a lot of work but doesn't actually take all that long, since you only need 2-3 large carrots to get 2 cups worth of grated carrots. You can also grate them in a food processor, but make sure they are very finely grated or they may not soften enough as the cake bakes. Like this recipe? Please rate it and leave a comment, and sign up for my email list to receive my recipes straight to your inbox every time I post! This recipe is god sent! 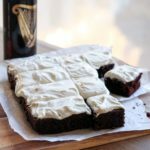 I was looking for a carrot and coconut recipe but could not find a single one that was 1 layered. I resigned myself to just a carrot recipe and yours looked the best! I then discovered it has coconut in it too 🙂 Make my day, I am off to make this now. You should definitely add ‘coconut’ as a meta tag as it did not show up in my search for ‘coconut carrot 1 layer cake’. I will definitely be returning to your site often in my hunt for 1 layered cake recipes. Thank for doing the math! Yay! Thanks Em! I am so glad it fit what you were looking for!! Hi Katie, thank you for the recipe! It was delicious. I omitted the shredded coconut and added chopped walnuts instead. I also halved the recipe to fit my 6-inch pan – there are only two of us too, and I always make cakes not only single-layer, but also tiny (only 4 servings!) 🙂 This recipe was so good, however, that I’ll make it in my 9-inch pan later as well. 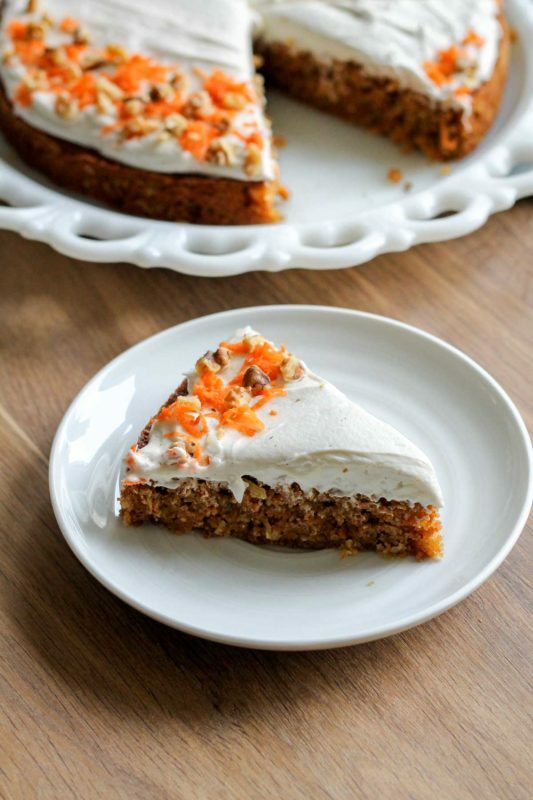 I feel like carrot cake is so underappreciated for some reason, but it’s definitely one of my favourite cakes! Thank you Maria!! I agree, not enough people know how amazing carrot cake is. So glad you enjoyed this and so great to know that it works to halve it! 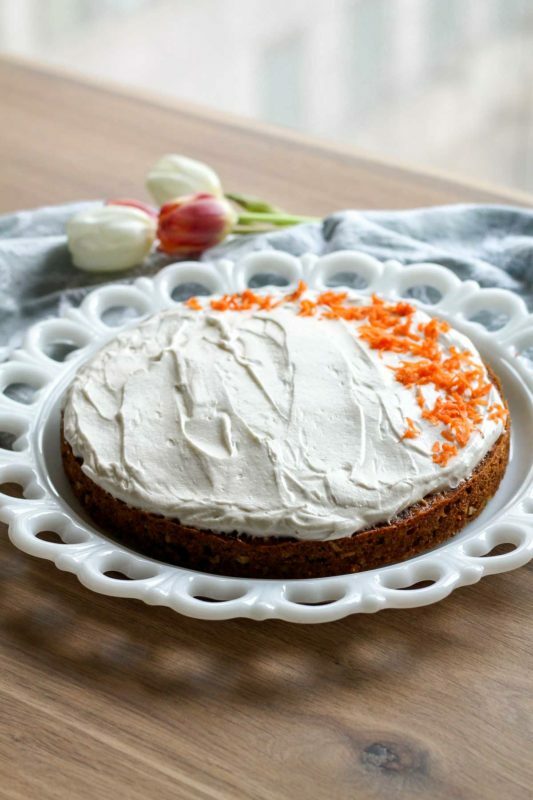 I made this wonderful single layer carrot cake for Easter, and it was excellent. I also shared leftovers and made a few more friends happy. 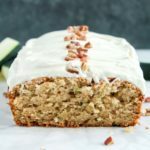 I really liked this recipe because the cake turns out really light, it’s not as dense as my other carrot cake recipe. I made a couple of additions, 4oz crushed pineapple, 2 tbs burbon whiskey, and I toasted the coconut. The only complaints I recieved, where ‘no walnuts’… so next time i’ll Add 1/2 cup chopped walnuts and probably add some grated orange zest to the cream cheese frosting. Thanks so much for this recipe! Hi Thomas, I love your additions to the recipe! Thanks so much for the comment.